FashionEASTa Fashion Show – Limited VIP Ticket Front Row Tickets! 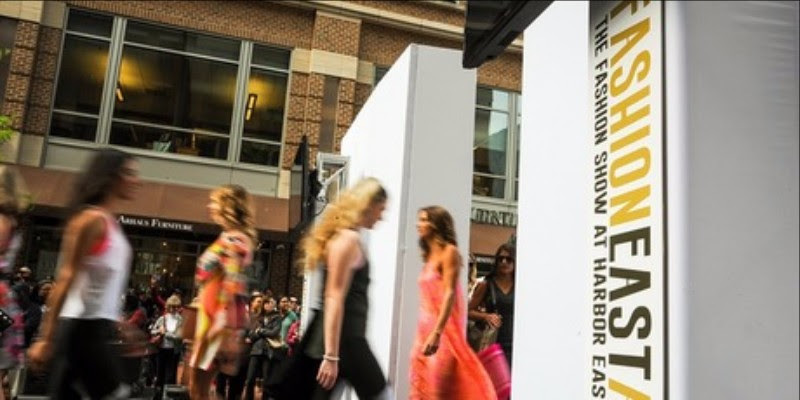 Become a VIP at Harbor East’s FashionEASTa Fashion Show! The event is FREE and open to the public but you’ll want to reserve a VIP Ticket for the full red carpet experience. Amaryllis: Shop new designers: Freida Rothman, ela rae and Mabel Chong along with Local Designers, Suchi and Natalie Ziegler. Enjoy complimentary wine and cookies plus register for a $75 Amaryllis Gift Card Giveaway. Arhaus: Enjoy refreshments provided by Teavolve Cafe and enter for a chance to win a $1,500 gift card. Be sure to sign up with a Design Consultant for Complimentary Design Services! Blanca Flor Silver Jewelry: “Shop our looks” from the runway enjoying light refreshments. Receive a free gift of sterling silver ball post earrings with all purchases over $50. PLUS enter our raffle to win a $50 gift certificate. Brooks Brothers: Take $25 off your purchase of $100 or more during FashionEASTa. Christopher Schafer: Buy-one-get-one free ties and bow ties: all lengths and widths available. Curiosity: Receive a complimentary book of matches with a full-size candle purchase. Handbags in the City: Receive 30% off regular priced items and 50% off markdowns throughout the day. Haute Blow Dry Bar: Receive 20% off all styling products and gray touch up powders. lululemon athletica: Enjoy light complimentary beverages from HEX kombucha. MAC cosmetics: MAC Select program is being offered to all new customers. The store is also offering complimentary focus demonstrations and color match foundation sampling. Sassanova: For every Trina Turk purchase, customers will receive a FREE GIFT with purchase: a colorful canvas Trina Turk tote bag. For any Trina Turk purchases over $250, customers will receive a signature piece of Trina Turk Collection jewelry. Additionally, the following will be happening in the store: Delight in Trina Turk’s favorite cocktail – the white wine spritzer – and savor small bites in store throughout the day; Enjoy up to 30% off on select designer footwear and new spring clothing; Share your social media savvy by entering contests to win a Sassanova gift card. South Moon Under: South Moon Under is offering 20% off your entire purchase plus raffling off a $100 gift card. Under Armour Brand House: Take 20% off the UA Run Mesh Tote. See store for details. White House/Black Market: Receive 10% off your entire purchase + 5% for full WHBM Rewards Members. We’ll be adding more promotions and in-store events in the coming weeks!